Full disclosure – I was provided a copy of this book by the author, however, have voluntarily chosen to write a review. All opinions are my own. Una Waters is back in the follow up to A Gleam of Light. Three years have passed since the previous events that saw Una smuggling a priceless Hopi artifact out of her native land to keep it safe from those who do not understand its power. Having returned to her full duties in Washington D.C., Una is sent on assignment in New York’s Chinatown to investigate a series of cyber breaches incurred by the NYPD. While there, she meets up with General Ashcroft and Jack Howser as well as a few new faces as they investigate what happened. After Una experiences a disturbing gap in her memory during the Chinese New Year parade followed by several other eerie incidents surrounding the visiting Chinese Ambassador and a rogue street gang, she beings to suspect that the threat may not be earthly. With time not on their side, Una and her companions begin to unravel a mysterious prophecy that if fulfilled may place the entire planet in peril. 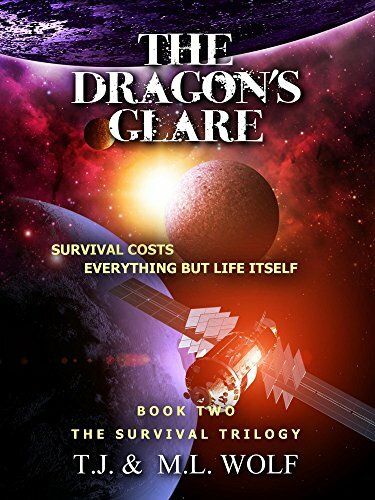 Where A Gleam of Light was heavily laden with Native American (Hopi) lore and prophecy, The Dragon’s Glare delves deep into Asian mysticism and legend. I really love how the action begins almost immediately and builds to a crazy climax. With everything from traditional Chinese culture, and violent cultish gangs to a mysterious diplomat, it doesn’t seem like there would be a connection, but Una persists and finds it. I’m sure, at first Una feels a tad out of her element, but once she bonds with the owners of the Lao-Chi restaurant, she gains some crucial clarity regarding the situation she finds herself facing. That aspect, for me, was a really nice touch and helped ground and focus Una while adding a bit of intrigue to an already interesting narrative. While it’s not necessary to have read A Gleam of Light prior to this new book, it may help to add some background information regarding the main characters and their journey to this point in time. Once again, the duo of T.J. and M.L. Wolf have delivered a fascinating story based on events that will have even the staunchest skeptic rethinking the age-old question “Are we alone in the universe?” If you like your speculative fiction more on the paranormal side this book will not disappoint. I am interested to see where Una’s story finishes when the final book is released later this year.